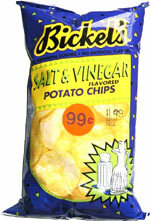 Taste test: Good, solid chips that have a strong taste of salt and vinegar. Enough salt to leave residue on your fingers. A good chip for $0.99 (what we paid). Smell test: Strong vinegar smell. 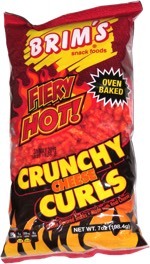 Company: Bickel's Snack Foods, Inc. This snack was discovered by Keith and Melissa at Gayle's Market, outside Harrisonburg, Virginia. Review published .